Every mummy has their favourite diaper brand for their child — the diaper brand that fits their child well, holds pee and poo well, and doesn’t cause diaper rash easily. Lucky for me, Emilee doesn’t have too sensitive skin and can take almost any diaper brand. However, that doesn’t mean I buy the cheapest brand in the market. I still have my favourite. Emilee started out with Huggies Ultra simply because she was very small as a newborn (she was only 2.1kg at birth despite being a full-term baby) and newborn size diapers were too big for her. Huggies Ultra had smaller than newborn sized diapers called Just Born size and they were readily available at CK. No luck with NTUC. When she slowly moved up to S size, I started to notice that her diaper would bunch up in front, sometimes causing leaks. That’s when I started looking for another diaper brand. I read online from other mummies that Japanese diaper brands were good for absorbency so I started trying Mamy Poko Extra Dry. Mamy Poko diapers were relatively cheap and good for Emilee. Then, I heard from mummies that Moony was pretty good albeit a little on the pricey side. My itchy fingers went to get a packet of that just to try and from there, I was sold. Both Mamy Poko and Moony are from the same Unicharm company so you could say that Moony is the premium cousin of Mamy Poko Extra Dry. While I’ll say that both brands are pretty equal in absorbency rate, Moony diapers are a lot softer in texture and not as stiff as Mamy Poko Extra Dry diapers. Well, if Moony is a premium diaper brand, there’s also Merries right? 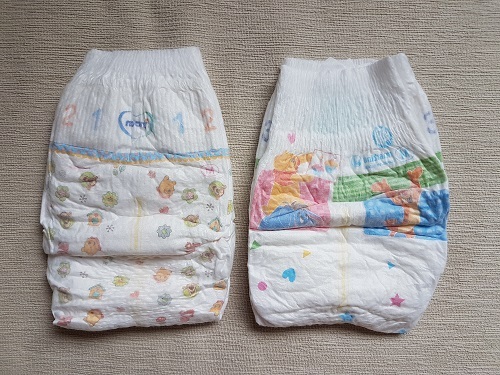 Having used a packet of Merries when Emilee was a newborn, I’ll say that Moony and Merries are good for the larger and wider cutting but I feel that Moony seems to be able to hold more pee for a slightly longer period of time compared to Merries. Front and back of Moony/Mamy Poko Airfit tape diapers. For the longest time, Moony was not available in Singapore stores and could only be bought online who brought in the supply from Japan. However, Singapore stores started stocking their shelves with it fairly recently. 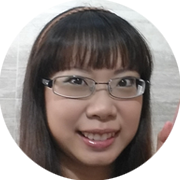 Moony is marketed in Singapore as Mamy Poko Airfit. A packet of the diapers cost around $26 no matter the size. Like most diaper brands, Moony diapers come with a wetness indicator. When dry, the double lines are yellow. When wet, the lines turn blue. The diapers are long enough and come with gathers at the back to prevent backflow pee leakage. The gathers are soft and stretchy so they do not leave any marks on baby’s skin. Back gathers of the diaper. What I like most about the diaper is the wider cutting and soft breathable material. The gathers at the leg prevent leakage from the side. Again, the side gathers are soft and stretchy, which do not leave angry red marks on baby’s thighs. Do not be fooled by the thin appearance of the diaper. For Emilee, it holds pee well anywhere from 3-5 hours. 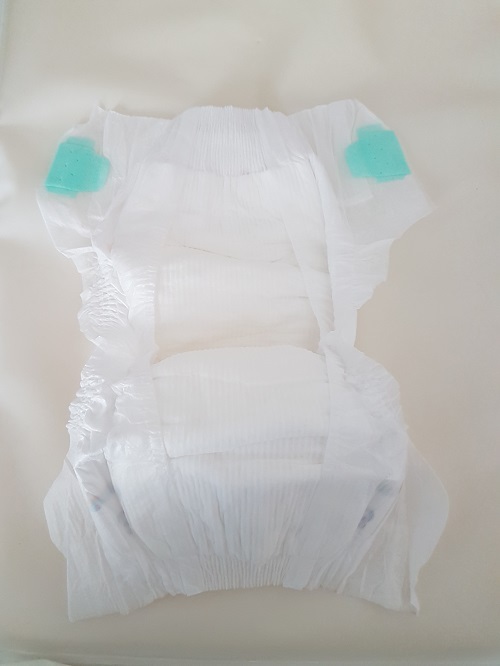 Soft breathable material of the diaper. 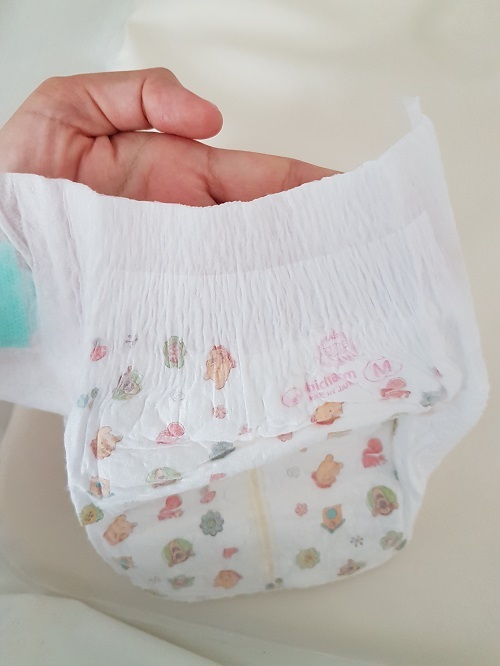 Moony tape diapers come in sizes from Newborn to L. It was only when I started using this brand that I found out that Moony also carried smaller than newborn sized diapers. Would try to get that if my next kid is small sized too, though it seems harder to find. Newborn size is for up to 5kg babies. Smaller than newborn size is for up to 3kg babies. Did I mention that diapers come with a cute Winnie the Pooh print? There are 6 designs in total with 2 designs in each packet. There were 10 designs to “collect” previously and I must say I was crazy over it. I would open each packet with much excitement. Yes, cheap thrill for me. Lol. This entry is purely based on my opinion. My advice is to get various samples of diapers to try and find the diaper brand that suits both you and your baby.